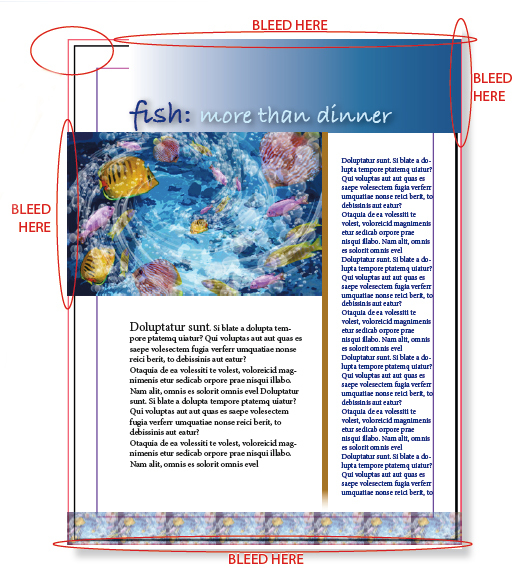 The Number One Problem with files sent for printing is No Bleed. Your art should have bleed if any item on a page touches the edge of the page leaving no margin; this can be on any or all sides of a page. Pictures, lines, art and text can all bleed off the page. Sometimes we can fix this problem without a new file, but usually, this problem stops production until a new file is made. 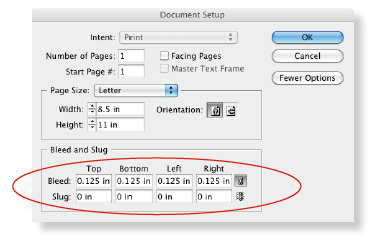 This post will show you how to set up bleeds on PDFs from InDesign. A little explanation might be necessary. Bleed is required for final trimming. Imagine your brochure/postcard/… as a stack of paper, hot off the press, ready to be trimmed. A big metal cutting blade quickly slices through the whole stack. Great! But it can’t slice hairs, and that’s why bleed is necessary. Without a little extra ink past the trim, a sliver or too of plain white paper might show up looking bad and ugly. Follow these steps to be sure bleed is included on your files. Now the bleed is set. Outside Red Line = Bleed Area. If you don’t see this, make sure the View is set to “Normal” and “Show Guides” is active. 2. Locate any item – rule, picture, box, type, etc. that touches the trim edge and extend it past that edge all the way up to the red, bleed line. 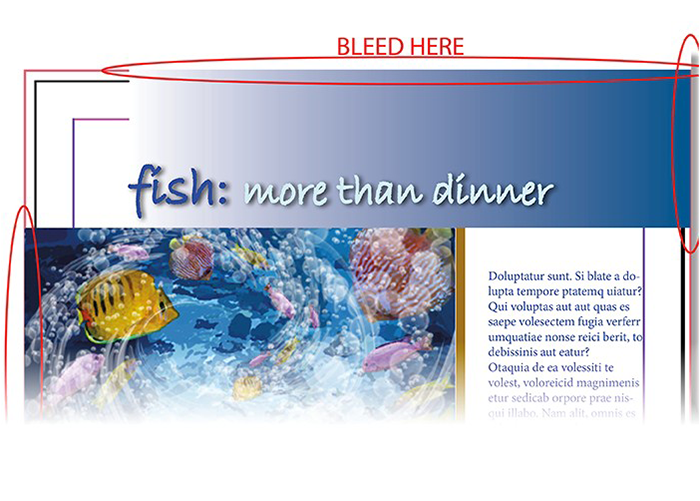 The page below shows how all of the items that touch the trim extend to the bleed area. 3. Export the file as a PDF. Select File>Export>Adobe PDF (Print)>Save. Now in the next window, select PDF/X-4:2010. On the left in that window, select “Marks and Bleeds”. Click “Crop Marks” and “Use Document Bleed Settings” (.125 should already appear in all four boxes); Export. That’s it! Your PDF should have marks AND BLEEDS! Download our Official LVG-PDFs-from-InDesign document, with more tips to prep your file for printing. Copyright 2019 Laurel Valley Graphics. All Rights Reserved.